A 2-week course on developing career goals through innovative vocational assessment, career development skills, and discovery. To register, click "Add to cart" link below and checkout. Log on at any time 24 hours a day during the course access period! Order must be paid to access. Principles of Career Planning: Using principles of self-determination, person-centered planning, discovery to develop career goals. Vocational Assessment: Career exploration strategies, including job shadowing and internet-based assessments, plus other tools such as interest inventories, workplace audits, and situational assessments. • Only one student per course registration. Each user needs their own course purchase. Group Rate when you purchase 3 or more registrations: 3-5: $145 ea. ; 6 or more: $135 ea. The discount will be applied automatically on checkout. Course: Job Coaching and Consulting - On Demand! A 2-week course on effective job design, instructional and behavioral support strategies, and the development of natural and co-worker supports. COURSE STARTS ON PURCHASE and LASTS FOR 14 DAYS FROM TIME OF PURCHASE. EXTENSIONS ONLY AVAILABLE WITH RE-PURCHASE. Log on at any time 24 hours a day during the course access period! To register, click "Add to cart" link below and checkout. Principles of Job Design: Steps to take after getting the job, including analysis and task design. Job Training and Instructional Support: Setting up learning strategies using task analysis, systematic instruction, natural learning and reinforcement, and data collection. Natural Supports: Learn to develop supports using natural features of the work site, including co-workers. Social-Behavioral Support: Develop strategies to support workers to interact in socially expected ways to enhance job success. • Only one student per course registration. Each user needs their own course purchase - if you are buying a multiple purchase for several students in your organization, you will need to forward us their first/last names and emails so they can be enrolled. Each needs their own email. Group Rate when you purchase 3 or more registrations: 3-5: $145 ea. ; 6 or more: $135 ea. Discount applied automatically on checkout. A 2-week course covering the key principles and hands-on tools for finding jobs for people with disabilities and other high-unemployment groups. To register, click "Add to cart" link below and checkout. Log on at any time 24 hours a day during the course access period! We have incorporated new and emerging information on using social networking over the Internet to develop job leads. We focus on LinkedIn, Twitter, Facebook, as well as discussing online applications. Introduction to Job Placement Marketing Research: Using marketing research to understand employers and their needs. Marketing Tools for Job Placement: How to develop brochures and other publications, as well as utilize special events, networking, and social media on the web to establish business relationships. Job Development Principles: Learn to approach employers and represent job-seekers with confidence. Job Development Tools: Know the tools job seekers and job developers need to represent their best qualities, from resumes to skills portfolios. Still not sure? 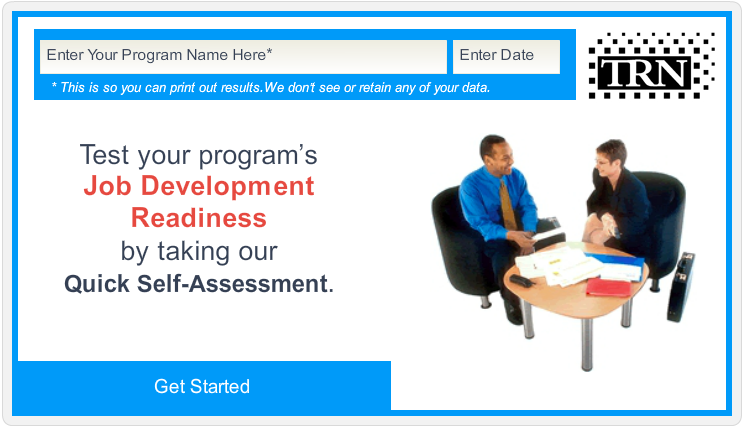 Take this FREE Quick Self Assessment to see whether you would benefit from training. A 2-week course on strategies to provide effective training for youth and adults with learning challenges. This course is on-demand 24 hours a day during course access period. Without good instruction, people with disabilities can find community living challenging. Independence, productivity, and integration are all based upon individuals having the skills necessary to be competent in specific situations, such as shopping for groceries, interacting with co-workers, and cleaning one’s apartment. 18 hour certificate for successful course completers. The discount will be applied automatically on checkout. Now over 3500 graduates from the US, Canada, Spain, the UK, Japan, Singapore, Ireland, Scotland, Malta, India and Australia. Up to seven days before the course, we offer full refund or credit. Because the course is limited capacity, once you are enrolled and less than one week before the course starts, we do not provide refunds, but offer a credit for a future course. Once the course starts, we do not offer any credit or refund.